Erfurt, a city of Prussia, in the province of Saxony, capital of an administrative district of the same name, midway between Gotha and Weimar, 145 m. S. W. of Berlin; pop. in 1871, 43,616. It was formerly a city of considerable importance, having at the end of the 16th century nearly 60,000 inhabitants. It is a fortress of the second class, and derives great strategical importance from its situation on the military high road of central Europe. Erfurt contains nine Lutheran and eight Roman Catholic churches, a synagogue, a deaf and dumb asylum, and several schools. The cathedral, a fine Gothic structure, which had suffered much from war, has been well restored within the present century. It contains one of the most massive bells of Germany, weighing 275 cwt. and dated 1447, called Maria Gloriosa, and in popular parlance Grosse Susanna, this having been the name of the bell melted during the fire in 1251. The finest modern churches are the Barfusserkirche and the Augustinerkirche. The most interesting religious building of Erfurt is the Augustinian convent, in which Luther lived for several years. It is now called the Martinsstift, and is used as an asylum for orphans and for other charitable purposes. 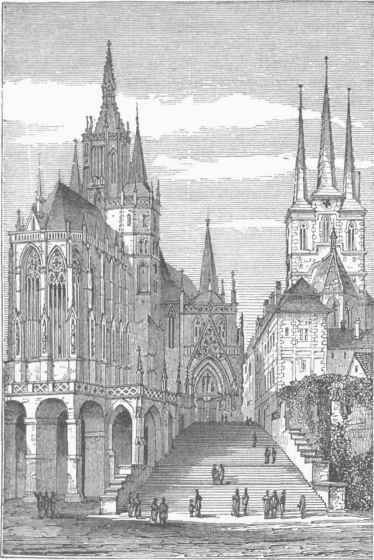 The university, opened in 1392, once the fourth in Germany, was suppressed in 1816. The royal academy of popular sciences is remarkable for its extensive library. - Erfurt was ceded to Prussia by the peace of Luneville in 1801; was taken by the French in 1806; was annexed to Westphalia in 1807; and was transferred by Napoleon to the duke of Saxe-Weimar in 1808. The congress of Erfurt (Sept. 27 to Oct. 14, 1808) was attended by Napoleon, Alexander of Russia, and the kings of Bavaria, Saxony, Wiirtemberg, and Westphalia. In 1813 the town was taken by the Prussians, after a destructive bombardment. From Nov. 24, 1848, to Aug. 4,1849, it was placed in a state of siege; and in March and April, 1850, the Unionsparla-ment of North Germany, convened by Frederick William IV., was held there in the church of St. Augustine.